It’s that time of year again, the time when the flu virus hits. Getting a flu vaccine every year is important for just about everyone, including people with diabetes. But unfortunately, because there are different strains of the flu, receiving the flu vaccine isn’t a guarantee that you won’t get the flu. Washing your hands often, not touching your face, disinfecting surfaces, and avoiding contact with sick people are other important ways to lower your risk. There’s one other tool in your flu-fighting arsenal, and that’s food. Along with the steps above, you might also be able to fend off the flu by regularly including some of these foods in your eating plan. Yogurt contains “friendly” bacteria called probiotics that balance out the mix of organisms in your digestive tract and give a boost to your immune system. Make sure to choose yogurt that has the words “contains live and active cultures” on the container. Other sources of probiotics include kefir (a yogurt-like drink), sourdough bread, sauerkraut, and unpasteurized (fresh) pickles. Chicken soup is good for more than the soul. 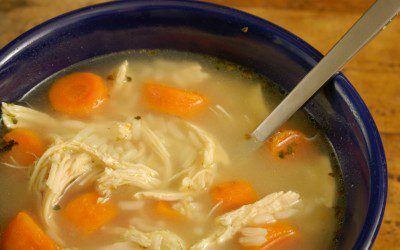 Besides the fact that a steaming bowl of soup is warm and goes down easy, chicken soup contains anti-inflammatory ingredients that help fight infection. 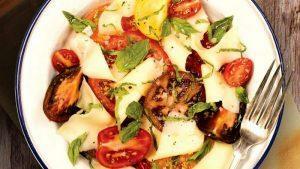 Homemade is best, but if you’re resorting to the canned variety, go for a lower-sodium version. One study found that in order for soup to do its job, you need to eat it regularly. It’s hard to say enough good things about almonds, but here’s one more: Almonds contain vitamin E which, in one study, helped older adults fight off colds and other respiratory infections. Vitamin E, besides being an antioxidant, also helps support a healthy immune system. Almond butter and almond oil contain vitamin E, as well, as does wheat germ oil, sunflower oil, and sunflower seeds. Not exactly the most popular nut, Brazil nuts are packed with a mineral called selenium, also needed for a healthy immune system. Researchers at the University of North Carolina, Chapel Hill, found that viruses can mutate and cause even more damage when there is a selenium deficiency. You can get selenium from other foods, too, such as tuna, halibut, mushrooms, eggs, and whole grains. Drinking tea is a comfort when you’re not feeling well, but it might also keep you from feeling unwell, too. Tea contains powerful antioxidants (polyphenols and catechins, anyone?) that can keep viruses at bay. Green tea may have an edge over other types, but black and oolong can do the job, too. These luscious legumes contain zinc, another mineral that works to keep our immune systems healthy. The role of zinc in preventing the common cold is still somewhat unclear, but zinc may prevent viruses from multiplying (including that nasty old H3N2 virus). Other foods rich in zinc include oysters, crab, beef, chicken, yogurt, and cashews. Papayas are bursting with vitamin C, another antioxidant vitamin that promotes a healthy immune system. This tropical fruit is great to eat “as is,” but it also makes a nice addition to salads and salsas. If papaya isn’t your bag, there are plenty of other vitamin-C–rich foods to choose from, including cantaloupe, citrus fruits, bell peppers, and Brussels sprouts. Even if you do end up getting the flu or a nasty cold, these foods are still helpful and healthful to include in your “sick-day” eating plan, thanks to the powerful nutrients they contain. They may even help get you on the mend so that you’ll be back on your feet before you know it!